February 11, 2019 - Coho salmon harvests in Alaska last year accounted for 3 percent of the total salmon harvest at 3.6 million coho. This is down considerably from last year's harvest of 5.25 million fish but relatively on par with the years prior to that. Recently, harvests have been lower than expectations set by the Alaska Department of Fish and Game, with the exception of 2017. Pricing throughout the past six months on headed and gutted bright skin Coho salmon has been quite steady, between $3.70 and $3.75 per pound on 2-4s and $3.55 and $3.75 per pound on under 6 pound coho, slightly dipping within the last month. For Fillets, supply seems relatively slim, with pricing ranging between $7.20 and $7.40 since the summer months. 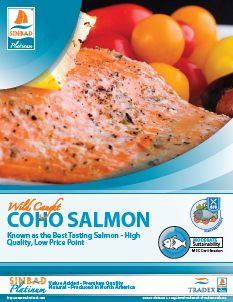 --- Farmed coho from Chile competes with the wild pricing on the West Coast here, mostly on the East Coast of the USA. In a recent report, farmed Coho was expected to have increased market share within the next five years, along with other aquaculture species. Several Chilean farms received antibiotic-free status in 2018, about 43 percent increase from the year before, which is a step further to increased demand from Farmed buyers. For wild buyers, pricing remains steady with decent supply on headed and gutted still in the market. The ADFG has yet to release reports for 2019 forecasts so stay tuned to the 3 Minute Market Insight for an update when forecast reports arrive. 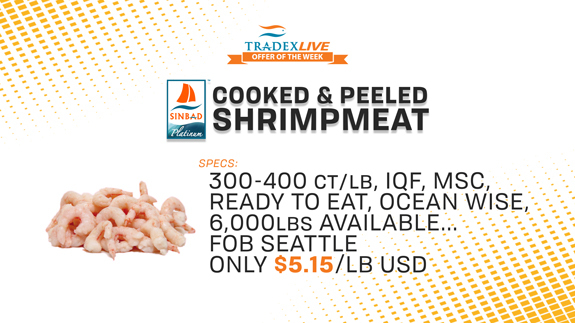 And Finally, our TradexLIVE offer of the week is for Sinbad Platinum Cooked and Peeled Shrimpmeat. We have 6,000 lbs available in Seattle of our 300-400 count per pound shrimpmeat processed in Oregon at $5.15 per pound USD. 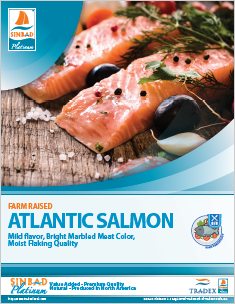 SINBAD Platinum products are harvested from sustainable fisheries (when possible) and are produced from the finest raw materials with exceptional harvesting and processing standards. All products follow our industry best 7-Step Quality Control Process delivering comprehensive inspections at every stage of processing. Our SINBAD Platinum Brand is our Once-Frozen, Zero Additive, Premium Quality product line produced in North America.